Another issue in the wider subject regarding the festivals is the teaching and example of the apostles in relation to the ceremonial law. Read on to find out why Paul attended the festivals. What effect did the preaching of the apostles have? “And at that time there was a great persecution against the church which was at Jerusalem; and they were all scattered abroad throughout the regions of Judaea and Samaria, except the apostles.” Acts 8:1. “The Pharisees were angry as they perceived that the tendency of the disciples’ teaching was to undermine the Jewish ceremonies, and make the sacrificial offerings of no effect.” Acts of the Apostles, p. 78:1. “Following the death of Stephen, the Jewish leaders sought by every means possible to check the spread of the gospel. In the most positive terms the members of the Sanhedrin forbade the disciples to preach in the name of Jesus. But every effort to put down the new religion seemed only to increase its strength, till it threatened to destroy the rites of the temple and the customs of ages.” Review and Herald, March 16, 1911, par. 1. “The success attending the preaching of the gospel aroused the anger of the Jews anew. From every quarter were coming accounts of the spread of the new doctrine by which Jews were released from the observance of the rites of the ceremonial law and Gentiles were admitted to equal privileges with the Jews as children of Abraham. Paul, in his preaching at Corinth, presented the same arguments which he urged so forcibly in his epistles. His emphatic statement, ‘There is neither Greek nor Jew, circumcision nor uncircumcision’ (Colossians 3:11), was regarded by his enemies as daring blasphemy, and they determined that his voice should be silenced.” Acts of the Apostles, p. 390:1. Even so, what was the tendency even among converted Jews, especially in Jerusalem? “The Jewish Christians living within sight of the temple naturally allowed their minds to revert to the peculiar privileges of the Jews as a nation. When they saw the Christian church departing from the ceremonies and traditions of Judaism, and perceived that the peculiar sacredness with which the Jewish customs had been invested would soon be lost sight of in the light of the new faith, many grew indignant with Paul as the one who had, in a large measure, caused this change. Even the disciples were not all prepared to accept willingly the decision of the council. Some were zealous for the ceremonial law, and they regarded Paul with disfavor because they thought that his principles in regard to the obligations of the Jewish law were lax.” Acts of the Apostles, p. 197:1. What else contributed to this situation? “The Gentiles, and especially the Greeks, were extremely licentious, and there was danger that some, unconverted in heart, would make a profession of faith without renouncing their evil practices. The Jewish Christians could not tolerate the immorality that was not even regarded as criminal by the heathen. The Jews therefore held it as highly proper that circumcision and the observance of the ceremonial law should be enjoined on the Gentile converts as a test of their sincerity and devotion. This, they believed, would prevent the addition to the church of those who, adopting the faith without true conversion of heart, might afterward bring reproach upon the cause by immorality and excess.” Acts of the Apostles, p. 192:2. What did some of these zealous converts preach to the Gentile converts? “And certain men which came down from Judaea taught the brethren, and said, Except ye be circumcised after the manner of Moses, ye cannot be saved.” Acts 15:1. “While the apostles united with the ministers and lay members at Antioch in an earnest effort to win many souls to Christ, certain Jewish believers from Judea ‘of the sect of the Pharisees’ succeeded in introducing a question that soon led to wide-spread controversy in the church and brought consternation to the believing Gentiles. With great assurance these Judaizing teachers asserted that in order 189 to be saved, one must be circumcised and must keep the entire ceremonial law.” Acts of the Apostles, pp. 188-189. “The Jewish converts generally were not inclined to move as rapidly as the providence of God opened the way. From the result of the apostles’ labors among the Gentiles it was evident that the converts among the latter people would far exceed the Jewish converts in number. The Jews feared that if the restrictions and ceremonies of their law were not made obligatory upon the Gentiles as a condition of church fellowship, the national peculiarities of the Jews, which had hitherto kept them distinct from all other people, would finally disappear from among those who received the gospel message. “The Jews had always prided themselves upon their divinely appointed services, and many of those who had been converted to the faith of Christ still felt that since God had once clearly outlined the Hebrew manner of worship, it was improbable that He would ever authorize a change in any of its specifications. They insisted that the Jewish laws and ceremonies should be incorporated into the rites of the Christian religion. They were slow to discern that all the sacrificial offerings had but prefigured the death of the Son of God, in which type met antitype, and after which the rites and ceremonies of the Mosaic dispensation were no longer binding.” Acts of the Apostles, p. 189:2, 3. What was the reaction of the faithful apostles to this teaching? “When therefore Paul and Barnabas had no small dissension and disputation with them, they determined that Paul and Barnabas, and certain other of them, should go up to Jerusalem unto the apostles and elders about this question.” Acts 15:2. “Paul knew the mind of the Spirit of God concerning such teaching and took a firm and unyielding position which brought to the churches freedom from Jewish rites and ceremonies.” Acts of the Apostles, p. 200:1. “Before his conversion Paul had regarded himself as blameless ‘touching the righteousness which is in the law.’ Philippians 3:6. But since his change of heart he had gained a clear conception of the mission of the Saviour as the Redeemer of the entire race, Gentile as well as Jew, and had learned the difference between a living faith and a dead formalism. In the light of the gospel the ancient rites and ceremonies committed to Israel had gained a new and deeper significance. That which they shadowed forth had come to pass, and those who were living under the gospel dispensation had been freed from their observance. God’s unchangeable law of Ten Commandments, however, Paul still kept in spirit as well as in letter.” Acts of the Apostles, p. 190:1. What was finally agreed upon to settle the controversy? What was the decision of this council? “28 For it seemed good to the Holy Ghost, and to us, to lay upon you no greater burden than these necessary things; 29 That ye abstain from meats offered to idols, and from blood, and from things strangled, and from fornication: from which if ye keep yourselves, ye shall do well. Fare ye well.” Acts 15:28, 29. “The Holy Spirit saw good not to impose the ceremonial law on the Gentile converts, and the mind of the apostles regarding this matter was as the mind of the Spirit of God. James presided at the council, and his final decision was, ‘Wherefore my sentence is, that we trouble not them, which from among the Gentiles are turned to God.’” Acts of the Apostles, p. 194:3. “In this instance James seems to have been chosen as the one to announce the decision arrived at by the council. It was his sentence that the ceremonial law, and especially the ordinance of circumcision, should not be urged upon the Gentiles, or even recommended to them. James sought to impress the minds of his brethren with the fact that, in turning to God, the Gentiles had made a great change in their lives and that much caution should be used not to trouble them with perplexing and doubtful questions of minor importance, lest they be discouraged in following Christ.” Acts of the Apostles, p. 195:1. What was the effect of the decision? “30 So when they were dismissed, they came to Antioch: and when they had gathered the multitude together, they delivered the epistle: 31 Which when they had read, they rejoiced for the consolation. 32 And Judas and Silas, being prophets also themselves, exhorted the brethren with many words, and confirmed them. 33 And after they had tarried there a space, they were let go in peace from the brethren unto the apostles. 34 Notwithstanding it pleased Silas to abide there still. 35 Paul also and Barnabas continued in Antioch, teaching and preaching the word of the Lord, with many others also.” Acts 15:30-35. “The broad and far-reaching decisions of the general council brought confidence into the ranks of the Gentile believers, and the cause of God prospered. In Antioch the church was favored with the presence of Judas and Silas, the special messengers who had returned with the apostles from the meeting in Jerusalem. ‘Being prophets also themselves,’ Judas and Silas, ‘exhorted the brethren with many words, and confirmed them.’ These godly men tarried in Antioch for a time. ‘Paul also and Barnabas continued in Antioch, teaching and preaching the word of the Lord, with many others also.’” Acts of the Apostles, p. 197:2. What did the apostle Peter learn about the ceremonial separation between Jew and Gentile? “And he said unto them, Ye know how that it is an unlawful thing for a man that is a Jew to keep company, or come unto one of another nation; but God hath shewed me that I should not call any man common or unclean.” Acts 10:28. How did Peter relate this experience to his brethren? “Once before, Peter had reasoned with his brethren concerning the conversion of Cornelius and his friends, and his fellowship with them. As he on that occasion related how the Holy Spirit fell on the Gentiles he declared, ‘Forasmuch then as God gave them the like gift as He did unto us, who believed on the Lord Jesus Christ; what was I, that I could withstand God?’ Acts 11:17. Now, with equal fervor and force, he said: ‘God, which knoweth the hearts, 194 bare them witness, giving them the Holy Ghost, even as He did unto us; and put no difference between us and them, purifying their hearts by faith. Now therefore why tempt ye God, to put a yoke upon the neck of the disciples, which neither our fathers nor we were able to bear?’ This yoke was not the law of Ten Commandments, as some who oppose the binding claims of the law assert; Peter here referred to the law of ceremonies, which was made null and void by the crucifixion of Christ.” Acts of the Apostles, p. 193:2. “The time had come for an entirely new phase of work to be entered upon by the church of Christ. The door that many of the Jewish converts had closed against the Gentiles was now to be thrown open. And the Gentiles who accepted the gospel were to be regarded as on an equality with the Jewish disciples, without the necessity of observing the rite of circumcision.” Acts of the Apostles, p. 136:2. Even so, what did he unwisely do years later? “11 But when Peter was come to Antioch, I withstood him to the face, because he was to be blamed. 12 For before that certain came from James, he did eat with the Gentiles: but when they were come, he withdrew and separated himself, fearing them which were of the circumcision. 13 And the other Jews dissembled likewise with him; insomuch that Barnabas also was carried away with their dissimulation. 14 But when I saw that they walked not uprightly according to the truth of the gospel, I said unto Peter before them all, If thou, being a Jew, livest after the manner of Gentiles, and not as do the Jews, why compellest thou the Gentiles to live as do the Jews?” Galatians 2:11-14. “When Peter, at a later date, visited Antioch, he won the confidence of many by his prudent conduct toward the 198 Gentile converts. For a time he acted in accordance with the light given from heaven. He so far overcame his natural prejudice as to sit at table with the Gentile converts. But when certain Jews who were zealous for the ceremonial law, came from Jerusalem, Peter injudiciously changed his deportment toward the converts from paganism. A number of the Jews ‘dissembled likewise with him; insomuch that Barnabas also was carried away with their dissimulation.’ This revelation of weakness on the part of those who had been respected and loved as leaders, left a most painful impression on the minds of the Gentile believers. The church was threatened with division. But Paul, who saw the subverting influence of the wrong done to the church through the double part acted by Peter, openly rebuked him for thus disguising his true sentiments. In the presence of the church, Paul inquired of Peter, ‘If thou, being a Jew, livest after the manner of Gentiles, and not as do the Jews, why compellest thou the Gentiles to live as do the Jews?’ Galatians 2:13, 14. “Peter saw the error into which he had fallen, and immediately set about repairing the evil that had been wrought, so far as was in his power.” Acts of the Apostles, p. 198. What was the essence of Paul’s preaching on the ceremonial law? “The ceremonial law was given by Christ. Even after it was no longer to be observed, Paul presented it before the Jews in its true position and value, showing its place in the plan of redemption and its relation to the work of Christ.” Patriarchs and Prophets, p. 367:2. Why did he want to go to feasts at Jerusalem? “But bade them farewell, saying, I must by all means keep this feast that cometh in Jerusalem: but I will return again unto you, if God will. And he sailed from Ephesus.” Acts 18:21. “Paul greatly desired to reach Jerusalem before the Passover as he would thus have an opportunity to meet those who should come from all parts of the world to attend the feast. Ever he cherished the hope that in some way he might be instrumental in removing the prejudice of his unbelieving countrymen, so that they might be led to accept the precious light of the gospel. He also desired to meet the church at Jerusalem and bear to them the gifts sent by the Gentile churches to the poor brethren in Judea. And by this visit he hoped to bring about a firmer union between the Jewish and the Gentile converts to the faith.” Acts of the Apostles, p. 389:1. This is why Jerusalem remained an important center. “Little mention is made in the book of Acts of the later work of the apostle Peter. 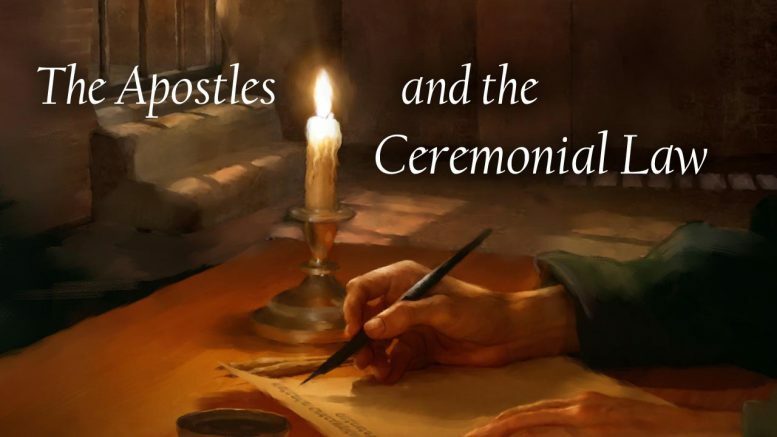 During the busy years of ministry that followed the outpouring of the Spirit on the Day of Pentecost, he was among those who put forth untiring efforts to reach the Jews who came to Jerusalem to worship at the time of the annual festivals.” Acts of the Apostles, p. 514:1. He also kept feasts in other places. “At Philippi Paul tarried to keep the passover. Only Luke remained with him, the other members of the company passing on to Troas to await him there. The Philippians were the most loving and true-hearted of the apostle’s converts, and he enjoyed a peaceful and happy visit with them during the eight days of the feast.” Sketches from the Life of Paul, p. 196:2. Did he involve his converts in the ceremonies? “Paul did not bind himself nor his converts to the ceremonies and customs of the Jews, with their varied forms, types, and sacrifices; for he recognized that the perfect and final offering had been made in the death of the Son of God.” Sketches from the Life of Paul, p. 105:1. How did he labor with Jew and Gentile? “When he had given many discourses upon these subjects, he testified that the Messiah had indeed come, and then preached the simple gospel of Jesus Christ. This was the craft which Paul mentions, saying that he caught them with guile. He thus tried to allay prejudice, and win souls to the truth. He refrained from urging upon the Jews the fact that the ceremonial laws were no longer of any force. He cautioned Timothy to remove any occasion for them to reject his labors. He complied with their rules and ordinances as far as was consistent with his mission to the Gentiles. He would not mislead the Jews nor practice deception upon them; but he waived his personal feelings, for the truth’s sake. “With the Gentiles his manner of labor was different. He plainly informed them that the sacrificial offerings and ceremonies of the Jews were no longer to be observed, and preached to them Christ and him crucified.” Sketches from the Life of Paul, p. 161:1, 2. What was the greatest difficulty he encountered? “The greatest difficulty Paul had to meet arose from the influence of Judaizing teachers. These made him much trouble by causing dissension in the church at Corinth. They were continually presenting the virtues of the ceremonies of the law, exalting these ceremonies above the gospel of Christ, and condemning Paul because he did not urge them upon the new converts.” Selected Messages, bk. 1, p. 236:1. Be the first to comment on "The Apostles and the Ceremonial Law"